the king is kneeling, and his right leg is stretched behind him in the position known as the "silver statue", a posture that is very specific to Karnak. He bows before Re, who is seated in his naos. The king wears a headband and the atef crown, flanked by two uraei on disks, all surmounting the horns of Khnum. The king holds the hek and nekhakha scepters in his right hand. In the king's left hand, he supports the symbols of the sed festival and longevity that hand beneath the "palm of the years" that Re holds with the was in his right hand. With Re's left hand, he reaches out to the horn of the king's crown. Behind Seti I's image we find a good example of the lion headed Sekhmet, who is here named "the great magician". She also holds, in her right hand, the "palm of the years, from which dangles some of the same symbols we find in the depiction of Re. Her left hand is raised.Amun-Re Kamutef, the prince of the Great Ennead of gods. Here, he wears an unusual headdress which is shaped tightly about his head. It is held in place by a band that extends in the back down to the pedestal. 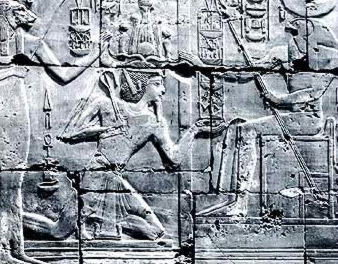 To the right, the king kneels before his Horus name supported by the ka. The king holds a basket of offerings above his head.